Here you can find information about various project I am working on, or have worked on in the past. - AMPAS, "9 Scientific And Technical Achievements To Be Honored With Academy Awards"
- Scientific American, "Oscars Honor Ingenious Screen Engineering"
- Inside Science, "Oscar Sci-Tech Awards Honor Ingenious Screen Science And Engineering"
- CTV, "Software developers from Canada win Oscars for technical achievement"
- Uni. Erlangen, "More than smoke and mirrors: FAU alumnus wins Technical Achievement Award"
- Int. Science Grid, "Bang goes the Simulation"
plus an additional illustration of the main advantages of mesh-based surface tracking for fluids. It was used in at least 20 feature films so far in total. - Blender, available with the full source code. Abstract: The movie consists of three clips to demonstrate the possibilities of controlled water simulations: 1. A magician pulls out water from a basin which forms a teapot by moving his hand upwards from the basin. 2. Water flows magically upwards a stair where it forms a human figure. This is achieved by using control particles from a reversed water simulation and from an invisible model. 3. The magician moves a duck out of water from one basin to another and vice versa. Finally, he pulls out two ducks from both basins which end up in a short "fight". 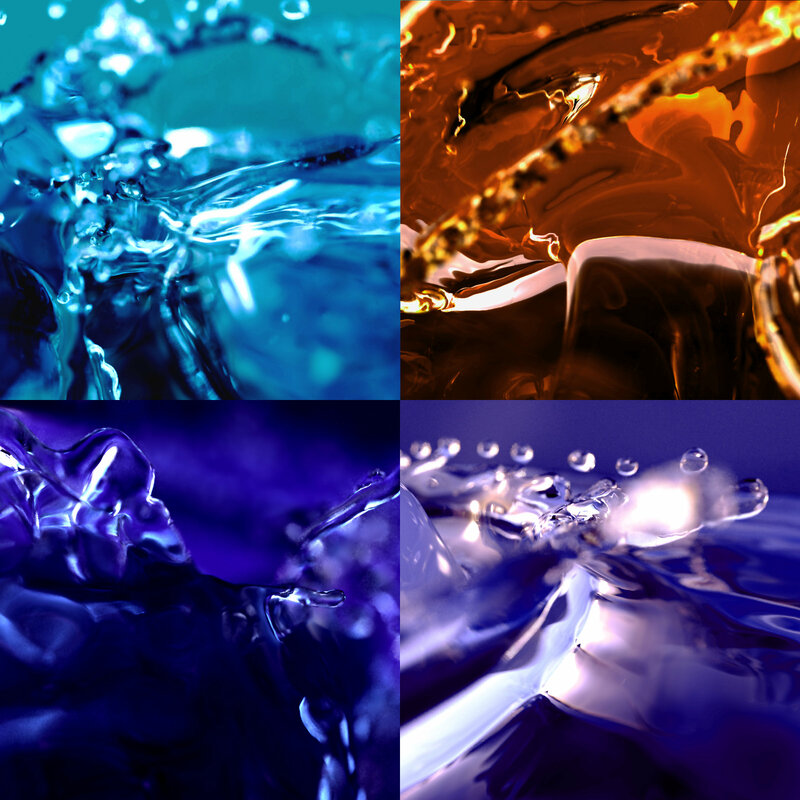 Abstract: These images were designed to recreate some of the effects typically seen in macro photography of liquids. They were simulated using the free surface LBM solver, and rendered with PBRT. Originally, each of the four images came with 5 smaller supplementary images containing variations of the main motive. These images won the "audience choice" award at the CGI 2006 conference. Abstract: The goal of this project was to include the LBM fluid solver of my Phd thesis into Blender. It got started nicely with a Google "Summer of Code" project. By now, the fluids module is included in all Blender releases, the sources can be found in the Blender repository under blender/intern/elbeem. Abstract: NiL is/was a fun open source game, with a gameplay mix of Worms and Quake. A while ago I provided some bugfixes for it. Check out the official NiL homepage above. By now there's an "updated", even cooler version with a whole bunch of new features and game mechanics (ropes, advanced team modes, slow motion zones etc.) that was developed by my LSS-colleagues. Abstract: POggPl was a free Ogg Vorbis player for PDSs with Palm OS 5 or higher. Sourcecode and third alpha version of POggPl were now released. You can still download it, to see if it works :) You need a PalmOS that supports the Palm SoundAPI, and some memory card with .ogg files on it. Abstract: WireScout was an onine platform for trading cables and associated materials online. Founded by three friends and me in 2001 as an "Aktiengesellschaft" (incorporated company), the platform was active for several years before it was taken over by Helukabel.